Western blot analysis of extracts from PC3 and C6 cells using Calreticulin (D3E6) XP® Rabbit mAb (HRP Conjugate). Incubate with Anti-biotin, HRP-linked Antibody (#7075 at 1:1000–1:3000), to detect biotinylated protein markers, in 10 ml of blocking buffer with gentle agitation for 1 hr at room temperature. Supplied in 136 mM NaCl, 2.6 mM KCl, 12 mM sodium phosphate (pH 7.4) dibasic, 2 mg/ml BSA, and 50% glycerol. Store at –20°C. Do not aliquot the antibody. 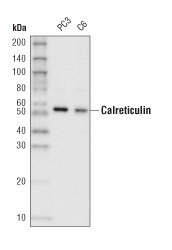 Calreticulin (D3E6) XP® Rabbit mAb (HRP Conjugate) recognizes endogenous levels of total calreticulin protein. Monoclonal antibody is produced by immunizing animals with a synthetic peptide corresponding to residues near the amino terminus of human calreticulin protein. This Cell Signaling Technology antibody is conjugated to the carbohydrate groups of horseradish peroxidase (HRP) via its amine groups. The HRP conjugated antibody is expected to exhibit the same species cross-reactivity as the unconjugated Calreticulin (D3E6) XP® Rabbit mAb #12238. Calcium is a universal signaling molecule involved in many cellular functions such as cell motility, metabolism, protein modification, protein folding, and apoptosis. Calcium is stored in the endoplasmic reticulum (ER), where it is buffered by calcium binding chaperones such as calnexin and calreticulin, and is released via the IP3 Receptor channel (1). Calreticulin also functions as an ER chaperone that ensures proper folding and quality control of newly synthesized glycoproteins. As such, calreticulin presumably does not alter protein folding but regulates proper timing for efficient folding and subunit assembly. Furthermore, calreticulin retains proteins in non-native conformation within the ER and targets them for degradation (2,3). Groenendyk, J. et al. (2004) Mol Cells 17, 383-9. Nauseef, W.M. et al. (1995) J Biol Chem 270, 4741-7. Williams, D.B. (2006) J. Cell Sci. 119, 615-623.